Shabab Rafah emerged victorious today on the pitch of Yarmouk Stadium in the Palestine Cup first leg. Ahli Al-Khaleel were faced with serious personnel challenges with several of their key players being denied entry into Gaza. 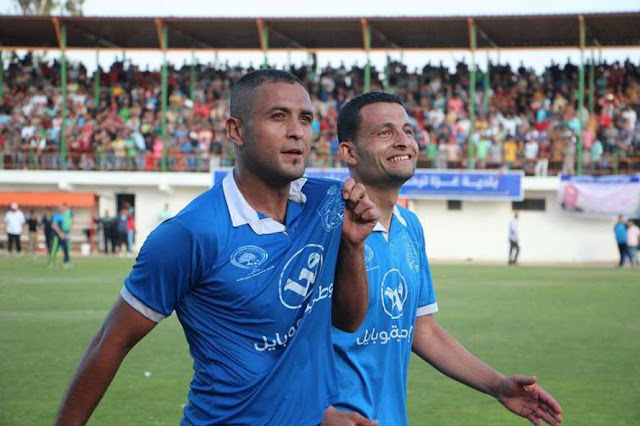 New signings Musab Battat, Sameh Maraaba, and Mohammed Maraaba did not make the trip alongside mainstay Shadi Shaban and a litany of other players. After a scoreless first half, Shabab Rafah found the opener vis-a-vis the penalty spot. Substitute Said Al-Sobakhi duly converting. Ahli Al-Khaleel's version of an attacking change saw Naim Abu Aker come on for CB Fadi Dweik. Abu Aker- Palestine's Olympic team goalkeeper took the gloves from Azmi Shweiki- who was then deployed as a forward. Despite a period of sustained possession- Ahli Al-Khaleel could not find an equalizer with Mahmoud Wadi (back with the side temporarily) and goalkeeper-turned-forward Azmi Shweiki coming closest. In the 86th minute Mohammed Abu Dan finished off a swift Rafah counter to make the score 2-0. In the dying embers of the game, Ahli Al-Khaleel were reduced to ten men with Musab Abu Salem receiving a second yellow. The scene now shifts to Hebron where Ahli will try to prevent Rafah from becoming the first Gazan side to lift the cup under this new format. Ahli Al-Khaleel have won the past two editions against Ittihad Shajaeya and Ittihad Khan Younes respectively. On both occasions the Hebron side came back from Gaza with at least a draw in the first leg.